We are finding that more and more Local Authorities are requiring a full survey of all the trees on any development site to be submitted with the planning application. Our tree surveys are produced (based on a topographical survey of the site) using British Standard method for tree surveys giving Crown spread, Species, Age, Height, Girth, Health, Aesthetic, Retention value and General comments and recommended surgery works on all individual trees and groups affecting the site. This thorough technique allows future problems to be spotted, such as basal cavities and allows an assessment on the Useful Life Expectancy of the tree. In addition to this we can indicate the Root Protection zone of each individual tree giving you the developer an accurate guide as to the extent developable land. It is quite often useful to carry out a full tree survey prior to the purchase and initial site planning to ascertain the viability of a site especially when a Tree Protection Order (TPO) is in place. This can save the developer valuable time and money at an early stage in the development process. Following on from the tree survey the information gathered can be used to provide tree protection information, including all details to the latest British Standard, helping the developer in the prevention of potential risk of prosecution. 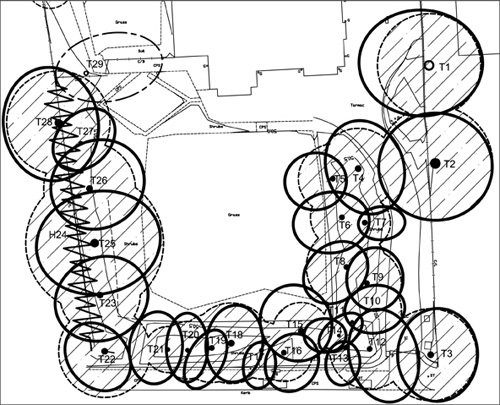 In addition to this we are able to provide specialized details for construction in and around the vicinity of protected trees allowing for sites with access issues to be developed where they may otherwise encounter problems. We are able to provide tailored Management Schedules for all types of landscapes including woodland, wetland, wild flower meadows, P.O.S. areas and sports pitches. These schedules are generally for up to 25 years and are often required by Local Authorities prior to the adoption of these areas or can be used to get quotations from management companies for long-term maintenance.